From time to time someone asks my advice as to how to begin collecting contemporary glass art. Assuming a new collector’s budget allows, does one begin by purchasing the best known glass artists such as Dale Chihuly, William Morris and Lino Tagliapietra? Or should a glass collector start with lesser known, up and coming artists and gradually work his/her way up to the better known (and more expensive) ones? Another common question is whether it is “better” to take the shotgun approach and have one piece each by a large number of glass artists or to focus one’s collection on a handful of artists or even limit most of one’s collecting to one or two artists. I think this subject is on my mind today because I received an email this morning from a long time collector of Dale Chihuly. He was proud to send me images of his collection which has over twenty major Chihuly works as well as many colorful Chihuly drawings on the walls. I know one other collector who has a variety of glass artists in her collection but focuses mainly on Lino Tagliapietra’s work, having at least one each of every major series Lino has ever done as well as a very large wall installation by Lino. 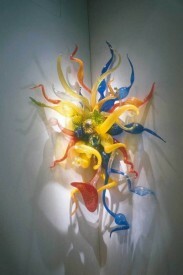 Other collectors, the majority of them, tend to have one or two pieces by many glass artists. This approach certainly leads to much more visual variety in a collection and allows the collectors to explore many styles, techniques, etc. There is truly no “best” way to collect glass art. The best way is the way that feels right to each collector. My advice is always to follow one’s own instincts in these matters. If it feels uncomfortable to jump in at the higher prices, do some looking around at galleries, art shows and on line and find some artists whose work you are attracted to in a lower price range. If you particularly love one glass artist, there is nothing wrong with concentrating most of your collecting on that artist and really getting to know the work in great depth. 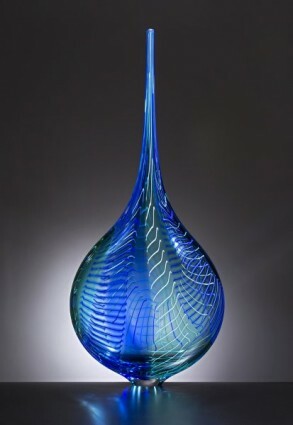 The one cardinal rule should be to always purchase pieces which one loves, not because other collectors or glass gallery dealers say that a certain glass artist is “important.” In the end, a major collection of contemporary glass will be a considerable investment and one’s best investment is in the personal enjoyment derived from living with beautiful glass sculpture on a day to day basis.